The Senate Judiciary Committee will begin confirmation hearings for President Donald Trump's Supreme Court pick, Neil Gorsuch, on March 20. Committee Chairman Chuck Grassley, R-Iowa, made the announcement on Thursday after consulting with the panel's top Democrat, California Sen. Dianne Feinstein. Grassley said he expects the confirmation hearings to last three to four days. The first day will include opening statements by committee members as well as by the federal judge tapped for the high court vacancy. Questioning of Gorsuch will begin on March 21. The hearing is the first step in the confirmation process, which Republicans hope to complete by April. The committee will then vote on the nomination, and it will move to the Senate floor. It's still unclear if Republicans will be able to get enough Democratic votes to move forward on the nomination. Because of expected Democratic procedural maneuvers, Republicans will likely need the support of 60 of the Senate's 100 members to move to a confirmation vote on Gorsuch. Republicans have a 52-48 majority, so at least eight Democrats will need to vote with Republicans. As part of the effort to woo some of those Democrats, Gorsuch has been making traditional courtesy calls to members of the Senate for the past few weeks. He's meeting with five Democrats and two Republicans Thursday. 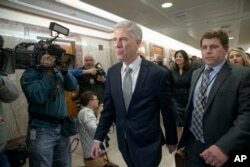 Supreme Court nominee Neil Gorsuch arrives for a meeting with Sen. Susan Collins, R-Maine, on Capitol Hill in Washington, Feb. 9, 2017. Gorsuch has said he found President Donald Trump's attacks on the judiciary "disheartening" and "demoralizing." Senate Democratic Leader Chuck Schumer said earlier this month that he has "serious, serious concerns" about Gorsuch, saying he had deflected many questions. But Gorsuch has shown some willingness to be independent from the president who nominated him, telling Democratic Sen. Richard Blumenthal of Connecticut that he found the president's attacks on the judiciary "disheartening" and "demoralizing." Trump had lashed out at a federal judge who issued a stay on his refugee and immigration ban, calling him a "so-called judge" in a tweet. Grassley said Gorsuch, a judge on the Denver-based 10th U.S. Circuit Court of Appeals, is "well qualified and respected" and has displayed independence. "It's time for him to have the opportunity to speak for himself before the judiciary committee," Grassley said. The vacancy occurred more than a year ago when Justice Antonin Scalia died. Republicans refused to consider former President Barack Obama's nominee, Merrick Garland, insisting that voters should have a say.